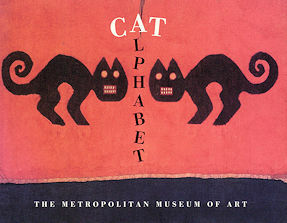 This hard back book features works of art from The Metropolitan Museum Of Art collection of painting and sculptures that represent the cat for each letter of the alphabet. 28 color illustration throughout. The book is 5 3/4" wide x 4 1/2" high. Copyright 1994, First edition.